If you prefer staying in a vacation home (rather than a townhome) here is the list! 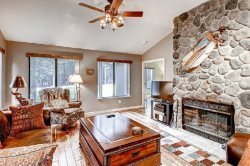 Our Luxury Vacation Homes have large decks, most have A/C and just a bit more room in the living areas for you and your family to hang out in, after spending the day outside in our mountains. Gorgeous Home in Grizzly Ranch with Additional Apartment over the garage. Modern, Serene and Beautiful 2 bedroom home, with amazing deck.